We now offer the BLANK UNIVERSAL MCO / MSO. This form utilizes special paper, special inks, security watermark, embedded security strip, etc - everything required to comply with all AAMVA and ISO (iso.org) standards to be accepted throughout the US and worldwide. So, using one of our easy-to-edit-and-alter Word-file templates you can print - IN ONE SHOT!!! - everything you want/need for your MCO/MSO - and ONLY everything that you want for your MCO / MSO -- your company name and/or logo, whatever data fields and data you want, whatever verbiage you want/need and whatever serial number you want/need. 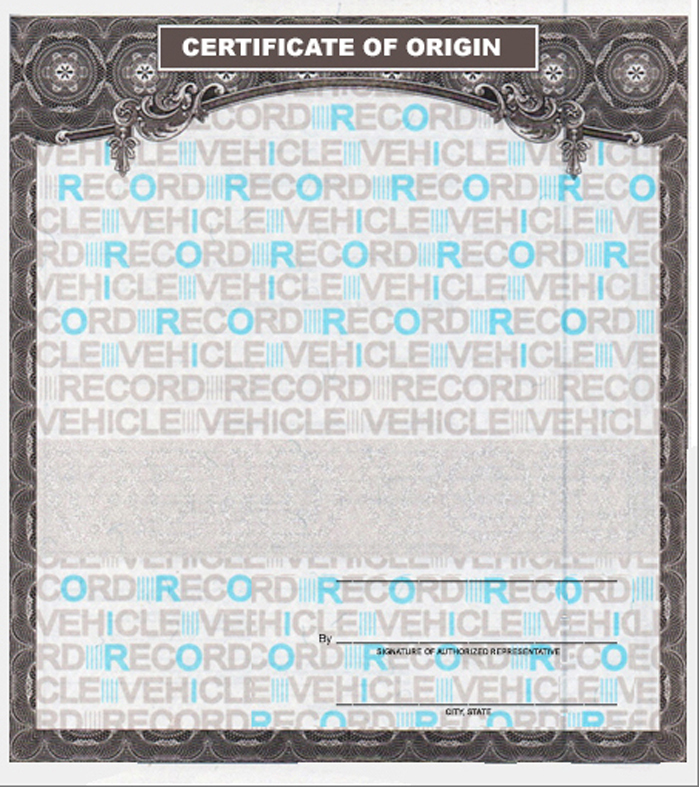 WHILE CERTIFICATES OF ORIGIN all often required for all kinds of products and they may not technically require these AAMVA-quality MCO certificates of origin, it is now very often the case that bureaucrats and inspectors (including state troopers, weigh stations, border patrol, customs inspectors, Canadian mounties, Coast Guard officers, etc) are now so accustomed to seeing the types of MCOs that they EXPECT such quality certificates for ALL Certificate of Origin applications - engines, transmissions, equipment, frames, boats, agricultural products, etc. So whether it is legally what you are required to use, it may be best to just satisfy the higher standards rather than to argue with bureaucrats. that you need to print on your particular certificates. SCROLL DOWN - to see images of the front and back of the form itself. There is a sample image of a completed one as well as the blank front and back images. PRINTING INSTRUCTIONS: These forms print on either inkjet printers or laser printers. With your purchase, in addition to shipping you the actual MCO forms, we will email you a Words-based (.doc) file to use as a printing template. Simply input the data you want on the template file in Word on your computer and print off a test of your certificate on a regular blank sheet of paper - then place the printed test sheet of paper over the certificate in front of a strong light to make sure everything lines up and prints EXACTLY where you need it to. Then, if needed, just simply adjust left to right with spaces and adjust height by changing the font size of the blank lines, then re-test and re-adjust until perfect BEFORE printing on the actual certificate - MCO MSO. It's really very easy. You just make sure you have the printed data going exactly where it is supposed to first using regular paper and this very simple test-print method BEFORE printing on the actual form - Very easy! 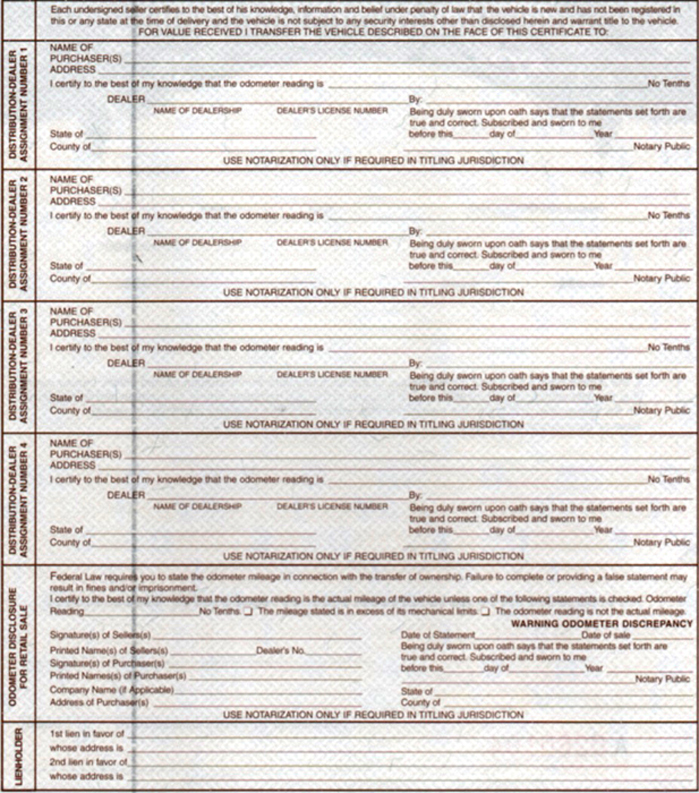 In addition to shipping you the official MCO form(s) that you order by Mail we will email you (at YOUR PAYPAL-PROVIDED EMAIL) our Word-based printing templates files to make printing-in your data on the certificate forms much easier( motorcycle, motorcycle frame, trailer, boat, hot rod, sand buggy/sand/rail, etc) and these .doc files can easily be altered by you to fit any product or project you are doing as well. To print your data on the MCO forms that we ship you, simply use the Word-based templates that I email to you and BE SURE to print tests on blank paper and hold them over the MCO form to check and adjust alignment BEFORE printing on the actual MCO form in order to ensure a perfect print. As part of the testing printing process, be sure to figure out by simply pre-marking the blank papers - which we you need to feed the form in order to print in your printer - top-bottom, upside-downside. With the UNIVERSAL MCO / MSO form you print EVERYTHING that you want/need on the certificate of origin in ONE SHOT... You can set up the template with really everything to print in one print - your name/logo, data spaces, data, verbiage, etc. You can change, add, delete, alter anything and everything and print in one shot. Just print on a blank sheet of paper first and hold it up over an MCO and see how it will print, making sure that you don't hit the borders, etc.. It's VERY EASY!!! Use the templates to come up with one that will work for you and your vehicle, project, or component (such as a frame or engine). Then input the data you need (VIN number, etc) and print on a blank piece of white paper and hold that up over the actual MCO form to test the registration and alignment - where it will print EXACTLY on the form - and adjust spacing and lines if needed until you get it perfect before printing on the actual form. The middle area of the front is for a dealership or distributorship if applicable, otherwise it can be used to designate the actual buyer. The back side contains the transfer spaces, lien space, and an odometer statement space. NOTE: DMVs generally do NOT want the buyer and the seller to be the same person. So in the case where you have built something like a bike or a frame that you wish to title to yourself, you will want to have someone else (spouse, friend, business partner, etc) sign as the manufacturer’s rep and on the back signing over the transfer space to you. We email you templates that are set-up completely for vehicles, vehicle components, boats, forklifts, etc. You pick and choose which template to use and you alter it any way you want to in Word or Pages (Mac) program... add you logo, change or add data spaces, verbiage, etc. Let us know if you need any changes to the templates - additional data spaces, etc. These printing templates are Word files so you can easily change them as well. HANDLING on MCOs : MCOs usually ship within two or three business days of ordering. You can use one of these templates below or design your own.